The Small Elephant | Just Shooting Memories! I often wonder what it would have been like to live hundreds if not thousands of years ago. What would the world have been like with out the convenience we enjoy today. Instead of deciding what television show to watch or what fast food restaurant to eat at, it would be deciding where to set up a trap or how to farm. If you did not, you would not eat. 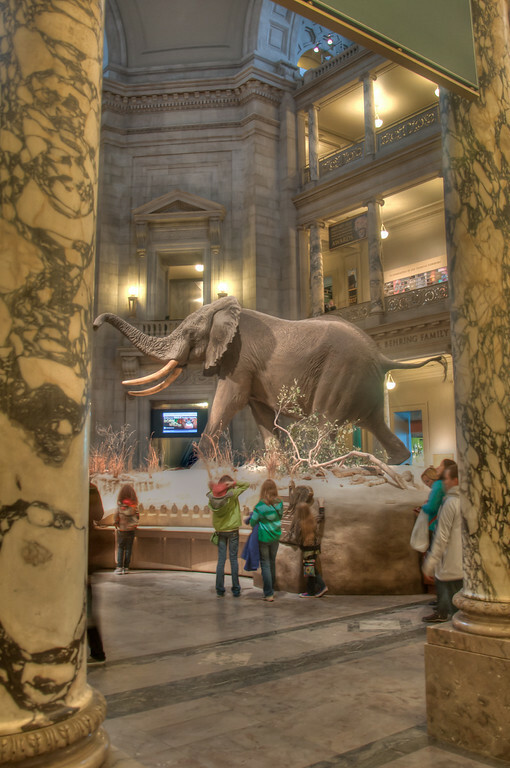 In the heart of the nations capital, Washington D.C., there is the Museum of Natural history. Part of the Smithsonian museums, it is home to dinosaurs, ocean creatures and the hope diamond. This shot is in the atrium of the museum where you are greeted by a very large elephant. Around this atrium, there are several levels and halls leading to wonderful history.